For the last 8 years I’ve gathered my friends in Yosemite National Park to celebrate my birthday (or, as of late, more of a “belated birthday” celebration). A few of us drove up early Friday morning and I watched an absolutely AMAZING sunset in Tuolumne Meadow: the sky to the east was filled with amazing lenticular clouds that glowed orange in the sunset. Afterwards, I hopped back in the car and drove to Olmsted Point. I knew that the moon wouldn’t rise until 2am and I had plenty of time to try to capture the Milky Way above Olmsted Point. I had recently downloaded the app “Sky Guide” and it told me the Milky Way would rise near Olmsted Point sometime around midnight. Most of my friends, including my photo friends, hadn’t arrived yet and I was all alone at Olmsted Point. It’s amazing how much creepier Yosemite can feel when it’s just you, crickets, and random eyes watching over you. Luckily the stars and the light pollution were so bright that I could see most of Olmsted Point without having to use a flashlight! 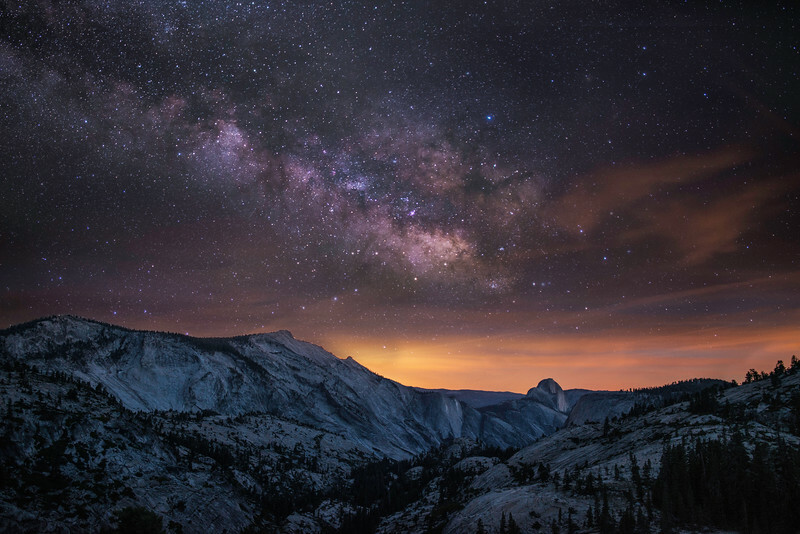 In early June the Milky Way is more horizontal in the sky and I loved the way it almost paralleled the mountains as it crept towards Half Dome, almost as if it was flying through the sky on its way to take a break on The Dome!